Following a successful run to the Super Bowl, New England Patriots tight end Rob Gronkowski has had a busy offseason. Between appearing in the new Entourage movie, throwing out the first pitch at a Los Angeles Angels game and shaving his head to support kids with cancer, Gronk took a few minutes to catch up with SI.com about his eventful summer, how he's training for next season and much more. SI.com: Have you incorporated anything new into your workouts this offseason? 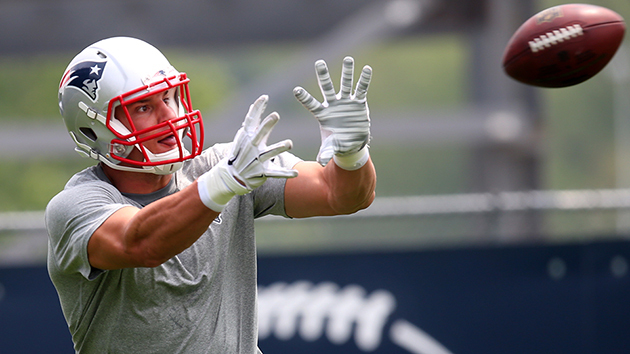 Rob Gronkowski: I’m just training hard. Nothing new really. I’ve been in the NFL for a little bit now, so there’s just a couple things here and there that you try out. But really, the key is keeping everything the same that works and just working hard. Doing what the program says to do and going out and working hard at it to stay in shape. Can you give me an example of one new thing you may have tried recently? RG: Um, I forgot what it’s called [laughs]. It’s a machine. A vertamax! You just strap it on and run with bands on. It gives you some resistance and power and gives you the strength to keep going with resistance while running. What kinds of techniques do you use to help with recovery? RG: After a workout, you definitely have to have a protein shake. I drink my six-pound whey protein all the time, too. I throw some fruit in there—strawberries, blueberries—with some peanut butter and banana and it gives you all the recovery you need from a hard day of lifting and running. ​​You mentioned how you follow a natural diet. What are you favorite pre- and post-game meals? RG: They’re a little different. Pregame you definitely want to carb up. We’ve got sweet potato fries, we’re eating chicken Alfredo with broccoli. You want to get all the nutrients that you need to get all the energy going in with the food. And then a nice clean peanut butter and jelly, with some healthy peanut butter, some fresh jelly, some bread and a banana on it too. And I go in with a nice chocolate milk, too. I love eating a lot right before the game. Because you’re burning, you’re running 90 routes a game you need all the energy, all that fuel to get through all four quarters. ​And post-game? That’s the only time I do a free-for-all. After a game, after a week of eating right, eating clean, you feel like that’s when you deserve a nice cheat meal and basically hop on anything after the game. You've been busy this summer. What was it like working on the set of the new Entourage movie? RG: Entourage was great. I filmed that over a year ago and it went super smooth, super well. Every part I shot made the movie which is very, very cool and it was just a great experience and I loved watching the shows growing up. I was just super excited to hear about the movie and just being in it. So it was definitely an honor, no doubt. SI.com: Which Entourage character do you identify with the most? RG: Just the way I live my life and everything, I would have to go with Vince, Vinny. How the way he rolls with his crew and everything. I feel like I could fit in with any of them just the way they roll and the way they are. But if I had to be one of the characters I would definitely be Vinny. 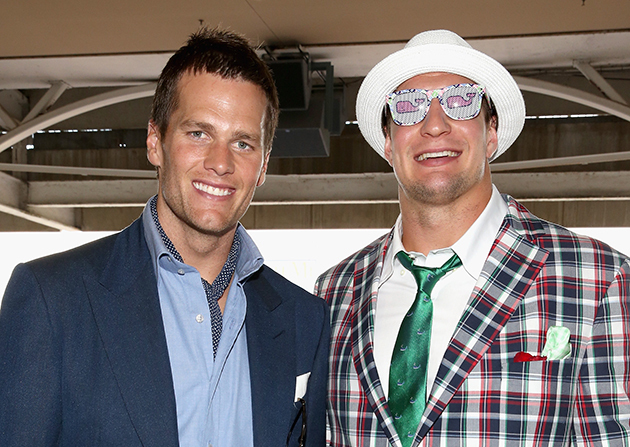 Tom Brady and Rob Gronkowski attend the 141st Kentucky Derby at Churchill Downs. ​​SI.com: How fun has it been working with directors filming things Entourage, and the latest BODYARMOR commercial? RG: It's a blast. Just going out to L.A., not really knowing exactly what I’m getting into, but I know I’m doing some throwback-type activities. It wasn’t just going in and doing a normal shoot, it was going in and having a blast. We’re putting on old gear, we’re putting on hockey gear. I put on a hockey mask, goalie equipment from like the 1970s. It was just hilarious and fun at the same time. And being with the other star athletes in it from all the other sports, it was just amazing and definitely just a fun time, for sure. SI.com: How good a hockey player do you think you would have been? RG: I actually played hockey my whole life all the way up until ninth grade. I was a pretty good hockey player, but I don’t have the skills anymore. I haven’t played in many, many years. I would’ve made a decent goalie, I think, just because I’m big. 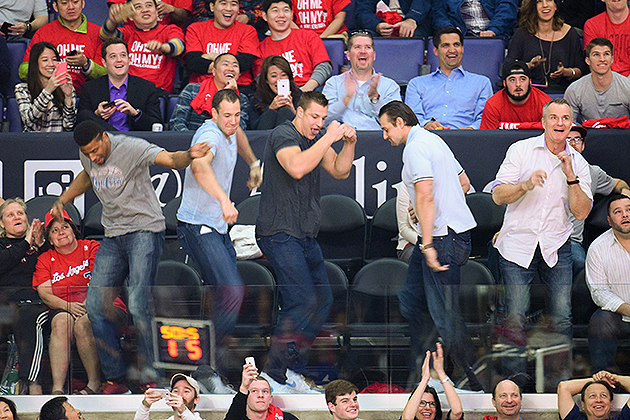 Rob Gronkowski (center) dances during 'Dance Cam' at a game between the Timberwolves and Clippers. ​SI.com: What was it like hanging out with guys like James Harden and Richard Sherman? RG: It’s great being with other athletes from other teams and other sports, basketball players, baseball players. You just get the feel of how they do things, you just want to incorporate how other players do things and bring that to your game. So it was cool hanging with Mike Trout, seeing other NFL players there, NBA players like James Harden. It’s definitely a cool experience learning from them, too. SI.com: What was the number one thing you learned from them? RG: ​Well, before I threw out the first pitch at the Angels game, I got to see how Mike Trout approaches the game, how he uses his athletic skills [in games]. He’s all business and he goes in with a demeanor that he’s going to get things done.